Taking potshots, Gandhi said "first they (BJP) talked about Narmada, followed by OBCs and then they moved to 'vikas' and eventually we saw a spectacle." 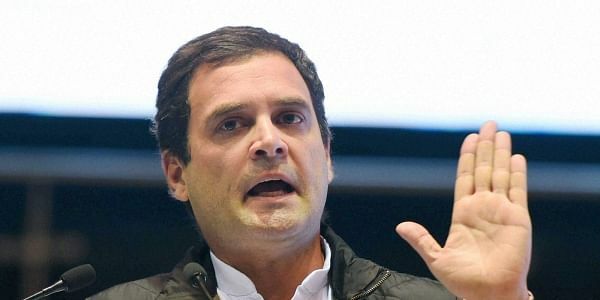 THIRUVANANTHAPURAM: The Congress president-elect Rahul Gandhi today hit out at the BJP, saying the saffron party's "complete bankruptcy" was exposed during campaigning for the Gujarat assembly polls. "As the campaign progressed, we saw complete bankruptcy in BJP. They diverted from one issue to another," Gandhi said at a function here in connection with the centenary celebrations of late RSP leader Baby John. Taking potshots, Gandhi said "first they (BJP) talked about Narmada, followed by OBCs and then they moved to 'vikas' and eventually we saw a spectacle." Targeting Narendra Modi, Gandhi said "In the last 3-4 days of the campaign, all that was left for the prime minister was to talk about himself and insult the previous prime minister (Manmohan Singh) of this country. That is all they have," he said. Expressing confidence about his party's good performance in Gujarat's two-phased polls that ended today, Gandhi said "we are going to defeat these forces." "These forces are not going to stand in front of us. The foundation of these forces is actually extremely weak. They have inherited marketing muscle and money. So they have very loud voice. But the voice is hollow," he said. He charged the BJP-RSS with trying to divide people on lines of caste and religion. Gandhi also said they were trying to get a foothold in Kerala. "It is our duty to fight these forces not only in Kerala but also in the country," he said. The congress leader said after spending time with people of Gujarat, they told him that the last 22 years (of BJP rule) "have been a lie." "The labourers and farmers and women have been forgotten. Health care system has been destroyed and there was a tremendous upsurge against the ideas of BJP in Gujarat itself," he claimed. Gandhi said the Congress worked unitedly on the basic issues of the people of Gujarat.